Sterling Bank is one of Nigeria’s largest banks. As an employer of more than 4,000 staff, its communication team is under no illusion as to the importance of effective message cut-through. Like many organizations of a similar size, it was becoming increasingly concerned that essential messages were being ignored. Traditionally, the team relied predominantly on email to communicate with its employees, who were located at multiple offices across the country. But due to the large volume of daily emails, communicators had no way of tracking whether the content was relevant and getting read, or whether staff were up to date with company news and information critical to their job. Furthermore, a significant amount of time was being spent developing email content and materials, yet with no sure way to measure their value. Sterling Bank's internal communications team was increasingly concerned that information overload was getting worse. Staff were missing important messages and emails were no longer an effective communication method. Recognizing the problem was only going to get worse, Sterling Bank began to investigate alternative communication methods. 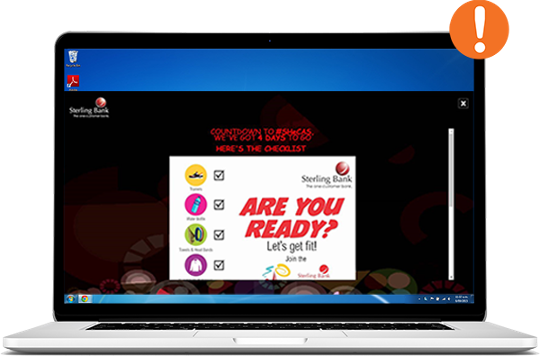 The bank opted for the SnapComms employee communication solution comprising desktop alerts, scrolling tickers, quizzes and surveys. Each of these were chosen for their ability to ‘cut-through’, with each performing specific communication functions. For example, as its staff deal with significant financial services and transactions, Sterling Bank did not want users to have to switch windows when reading their emails. The desktop alerts and tickers enable staff to be informed of important updates the moment they happen. The quizzes and surveys gave the internal communications team a holistic view and statistics on campaigns, to help make informed decisions. The useful targeting feature allowed the bank to segment its audiences, such as business units, departments and regions. This stopped irrelevant communications and reduced information noise – a key objective. Administrators quickly grasped the new software. “The system itself is easy to navigate and use, and the various video tutorials are extremely helpful,” says Kelvin. Internal communications have significantly improved within the bank – control of this important business function has been regained. It also means that when a message is delivered via the SnapComms platform, staff know to take notice. Important news is finally getting the required attention. There is now a stronger sense of identity and value attached to the Sterling Bank brand. Clever use of visuals and imagery is helping to inspire a greater sense of pride amongst staff, in a way that a wordy email never could. 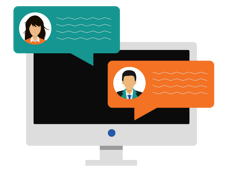 Staff can focus more on their duties without the constant interruption of emails.